An Exeter community group is looking for volunteers to help protect local people from flooding. St Thomas Community Emergency Group aims to have a flood warden in every street to help warn and support vulnerable residents in the event of a flood. The group is currently working on a community emergency plan with the Environment Agency. It is also helping businesses in St Thomas and Marsh Barton prepare for floods. Currently only a handful people have come forward as volunteers, but the group needs more. Flood warden training will take place on Saturday 12 March, at Exeter Fire Station, Dane’s Castle. The enhancement of Exeter’s flood defences means that the likelihood of flooding has reduced. However, should a flood occur the impact in St Thomas would be high. During March and April the group will practice their emergency response in St Thomas. They will be joined by the Environment Agency and Devon Fire and Rescue service who will provide training and support. Exeter St Thomas is at a very high risk of flash flooding from surface water. Following a period of sustained, intense rainfall, there’s potential for deep, fast flowing surface water to flood St Thomas. This type of flooding can happen suddenly with little warning. This is due to the speed at which the surface water would run off the steep valley sides to the west of St Thomas. Although this type of flooding is very rare, the consequences can be quite severe. Deep, fast flowing water has a lot of force. Surface water flooding happens when rainwater does not drain away. Either through the normal drainage systems or soak into the ground. It lies on or flows over the ground instead, before it enters a watercourse or drain. It’s associated with intense rainfall events. It happens when rainwater falls at a faster rate than the ground can absorb it rather than because a watercourse has overtopped its banks. Water flows across the land and puddles and ponds. This means that surface water flooding can happen many miles from a river. Often in places that people wouldn’t expect. It happens simply because there’s nowhere for the rain to go. When complete, the improvements to the Exeter flood defence scheme will reduce flood risk to large parts of St Thomas from the River Exe, however, the risk of surface water flooding will remain. Extreme flash floods from surface water are rare, but it’s important for the community to be aware, take action and be prepared. We need more active members and flood wardens. To join the group email dc.flood@environment-agency.gov.uk or call and ask for Devon and Cornwall Flood Resilience Team on 03708 506 506. 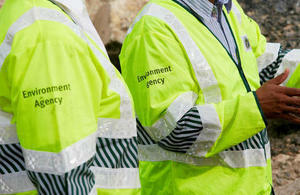 Follow us on Twitter @EnvagencySW. Exeter St Thomas is one of 52 communities in the South West at a very high risk of flash flooding. Attempting to leave the area may not necessarily be the best thing to do in a flash flood. If you know where to move to in a flash flood you are more likely to stay safe. Acting now and planning what you would do in the event of a flood could minimise the potential damage and distress that flooding causes.